Trek Stache 8 29er, What a brilliant bike it is! Trek Bikes have made the Stache blend 29er hardtail with simplicity trail-tuned suspension and spec. The Trail bike's geometry is constantly whispering, “Come on. Do it.” This really is trail bike perfection. Moving out: The Stache’s simplicity shines during setup. Set the saddle position, sag and rebound on the fork and you’re basically ready to hit the trail. Its short chainstays put your weight over the rear wheel, though the position is far from a stretched-out, cross-country style. The wide Bontrager handlebar and short stem combo is perfectly spec’d for control with the big wheels and trail geometry. Cornering: Big wheels usually offer solid traction through sweeping turns but can falter in hairpin switchbacks. Trek’s G2 geometry takes care of this. The G2 geometry seems to position the rider’s weight perfectly for keeping the front end feeling light and lively while still offering plenty of bite. Climbing: The Stache has trailbike chops but still benefits from its hardtail chassis when it comes to climbing. You get out what you put in on the climbs, and out-of-the-saddle efforts are rewarded with quick acceleration. While the frame is stiff, the large, 2.3-inch Bontrager tires absorb trail chatter and small rocks, making seated climbing surprisingly comfortable. 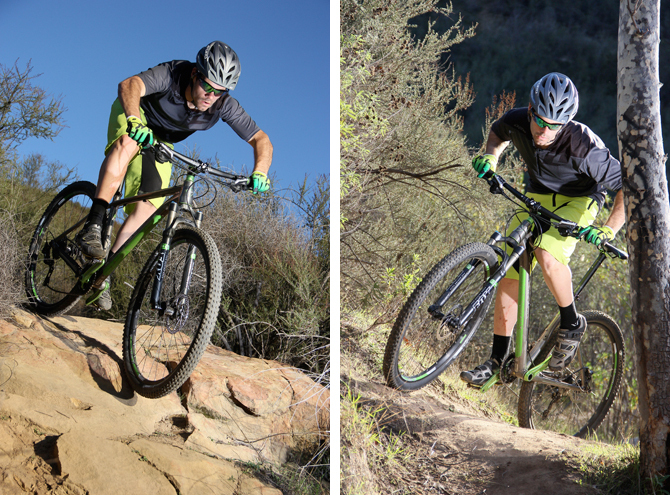 Descending: The Stache is one confident hardtail when it comes to descending. The geometry is stable at speed, and the frame’s burly construction had us pushing the Stache hard without feeling like it was close to its limit. While it is most at home on flowing singletrack, we piloted it down numerous rock-littered, all-mountain trails. We just had to pick our lines more carefully and slow down from our 6-inch-bike pace through the rougher rock sections. While the 17.5-inch rear stays keep the rear wheel tucked in tightly, the 29-inch wheels make the wheelbase feel long. Picking up the front wheel over obstacles or manualing through rollers takes a bit of work, even with a lowered seatpost. Braking: The SLX brakes may be Trek’s third-tier option for trailbikes, but they offer lever feel, modulation and power that is incredibly similar to their more expensive XT and XTR cousins. It is safe to say that if we were building a bike with our own hard-earned dollars, the SLX stoppers would be on our short list. On the surface, the Stache embodies a straightforward approach to trail riding, with a stout, aluminum hardtail frame, but upon further inspection, you’ll find that it’s packed with all of the modern features you would expect from today’s technical trailbikes, including a tapered head tube, Press-Fit bottom bracket, ISCG tabs, 142x12-millimeter rear thru-axle and internal cable routing. It also features routing options for the RockShox Reverb Stealth dropper post through the seat tube and a routing option for other posts along the underside of the top tube. The Stache features Trek’s G2 geometry, as well as some trail-ready numbers, including a 68.6-degree head angle and chainstays toward the short end of the spectrum for a 29er. The Race Face Turbine cranks grabbed our attention with their green anodizing and beautiful machine work. Up front, the Stache employs a 4.7-inch Fox Evolution Series Float fork with a CTD damper. It is mostly outfitted with Shimano’s new SLX components, except for the rear derailleur, which is a higher-quality XT with Shimano’s Shadow Plus technology. • 120mms for fork travel and a slack HT angle on a hard tail 29″er means that you can go pretty darn fast until the amber warning lights start flashing in your brain. But be careful as the front fork can write checks the back end cannot cash and so you need to ride it like a hard tail or things can get a bit surprising really fast. • The Bontrager components treated us well (other than the wheels issues jeffj discussed in his review/comments in the midterm). Both jeffj and we liked the stock Expert 29-3 tires and the 2.3 size was nicely plump. Overall, in dry conditions, they were solid performers. The saddle was just so-so. No one that rode the bike really loved it but no one hated it either. • Short chain stays are all the rage in the minds of some 29″er hard tail riders and in some cases that is what you need to make the bike work in certain kinds of stuff. But balance is more important than any one parameter and when you get in that 17″ and under range in the chain stay, you do begin to lose some overall balance in the bike. 17.52″/44.5 cm chain stays like the Stache has is a pretty good place to be in my opinion. It allows for a tall rider on a 72° seat tube angle to not get so far back over the rear axle of the bike as to feel like he is fighting to keep the front end planted on seated climbs yet they still allow for agile handling. It may not be what you need or want for gnarly BC-type trails, but for the majority of riders and as an all-around trail bike, it is spot on. • At 28 lbs. with pedals the Stache 8 is no XC race fighter but we rode it on some big loops and fought off the boys on the after-work evening rides and never gave up much in the process to the lighter, faster feeling stuff like Stumpy carbons, etc. Of course it is not an XC race bike, but neither is it incapable of lining up for an endurance race or some weekend event just for fun. If Strava KOMs are important to you, then maybe not this bike, but then most likely if this describes you, you already knew that and Trek makes a Superfly just for you. As a trail bike we never noticed the weight, standing, sitting, moving it around under me…never was an issue unless we were in a fast pack of greyhounds and then, we missed my Ti Lynskey a bit. Or we just pedalled harder!